Pin feed data processing computer pressure sensitive adhesive labels. Special shipping warning labels indicate whether shipments were dropped or subjected to excessive force, or not kept upright during shipping. 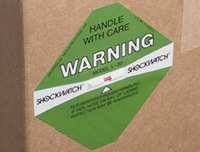 Placards and warning labels that indicate when shipments require special handling or contain hazardous materials. These pressure sensitive adhesive shipping labels indicate the presence of desiccant that protects product from moisture damage. 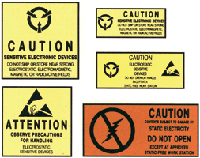 Pressure sensitive warning labels identify and indicate the presence of hazardous materials. 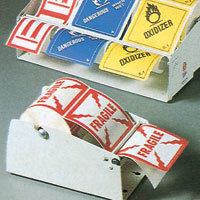 These pressure sensitive adhesive labels warn that contents are sensitive to static electricity.